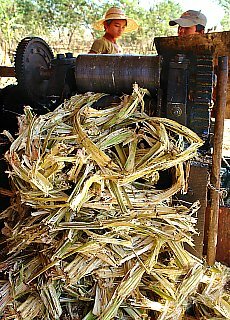 The utilization of the suggarcane flower began in 5th century before Christ in the eastasian countries, which counts to be the origin of the fastgrowing crop plant. 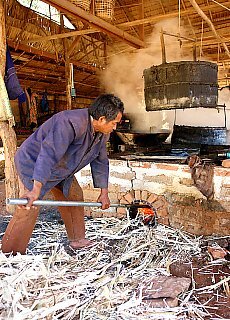 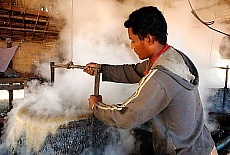 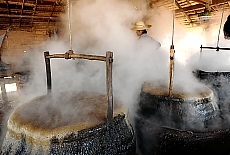 Sugarcane factory, sucrose, brown sugar, steaming boiler with brown sugarcane molasses, ancient suggarcane press. 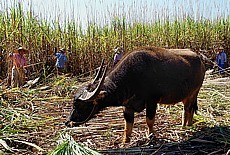 Poor burmese women cutting sugarcane with waterbuffalo on lake Inle.